OPI’s new City of Hope limited promotion celebrates City of Hope 2012 Spirit of Life honoree George Schaeffer. Each display features four bestselling OPI nail lacquers: Bubble Bath, Cajun Shrimp, Strawberry Margarita, and You Don’t Know Jacques! OPI will donate $6 for each display sold directly to City of Hope for the research and treatment of diabetes. 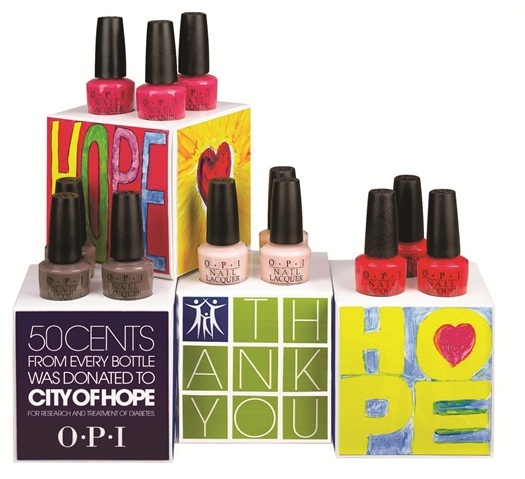 Available through the end of 2012, the promotion includes 12 nail lacquers (three of each shade) in a colorful display featuring artwork designed by City of Hope patients. Schaeffer will be presented with City of Hope’s distinguished Spirit of Life Award on July 21, 2012, during the Professional Beauty Association’s Beauty Week, hosted by Cosmoprof North America, at the Mandalay Bay Resort & Casino in Las Vegas.